We met with Ali and Rob early this past summer. They dated for over 10 years and have been planning their wedding for some time. But because they were both super busy with work, things stalled. Ali and Rob live a fun filled life in downtown Baltimore and they wanted their wedding to reflect this. 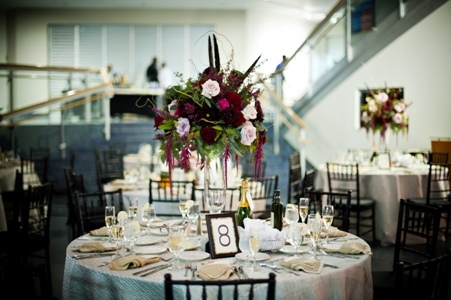 Ali and Rob selected the Maryland Science Center as the location to host their wedding. The look of the wedding was key to Ali. She wanted something fun, modern and different, and the Science Center definitely fit the bill. The Science Center has an exclusive contract with Aramark to manage and cater their private events. Rob, an executive with Aramark, was excited to have his company and staff service his wedding. Ali drew her inspiration and color palate from a picture in a magazine. 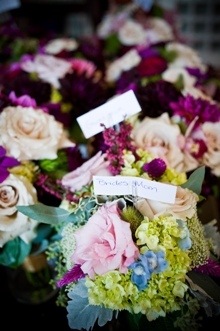 With this in mind she decided that her bridal party would each wear a different color from pale pink to deep burgundy. Needless to say, they all looked fabulous! Christine the owner of Fleur de Lis florist is so creative; I knew that she would be the perfect fit to create the unique look for Ali’s florals. 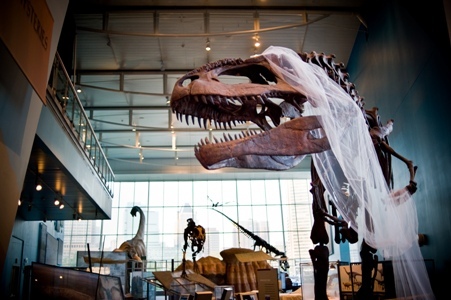 Ali and Rob’s wedding was planned at three very unique areas of the Science Center. 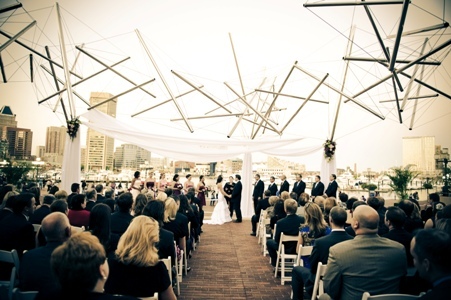 The ceremony was outdoors on the promenade with the alter situated between two large metal sculptures overlooking the Harbor. Dinner was inside the Science Center lobby with a huge Dinosaur overseeing the meal service. And finally, dancing and dessert was on the rooftop overlooking Baltimore’s Inner Harbor. Each area was designed to have its own look. For the ceremony, Perkins Productions hung huge white fabric swags between the metal sculptures. Fleur de Lis attached cascading florals to the base of the sculptures. And trees were rented from Plant Farm to give the area a softer look and a little privacy. Cocktail tables, bars and hors d’oeuvres were set up just outside of the main entrance so that guests could immediately enjoy themselves after the ceremony. The lobby was set with traditional round tables draped in beautiful linens showcasing both high and low floral arrangements. Uplighting by Perkins added a beautiful glow. 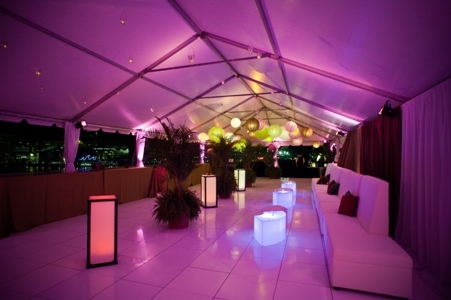 Lastly the “L” shaped roof top tent was transformed to look like a South Beach night club. Perkins installed a white floor over the entire area, hung pink, burgundy and green lanterns along with votive candles from the ceiling. Modular lounge seating was installed by Afr including illuminated cubed and scalloped side tables. Add Baltimore’s city lights as the background landscape and music from C&J entertainment (mixed by Chris himself), the energy was amazing! Ali and Rob’s family and friends partied all night long! 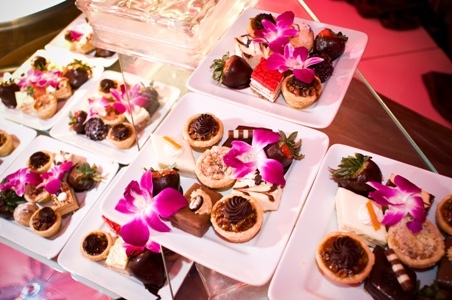 And when their guests needed an energy boost, they headed for the dessert table which was filled with tempting sweets and wedding cake. Yes, Science can be fun!